First, quality. Once installed, a Brodit mount looks like a factory fitment, and is rock-solid. The look and feel is worlds apart from a cheap mount. Second, flexibility. Brodit takes a two-part approach to mounting systems: the vehicle mount you attach to your car (which Brodit calls the ProClip), and the cradle which holds your device. By mixing-and-matching these, you can attach pretty much any device to any car, and put it right where you want it. It also means that when you come to update your phone, you only have to replace the cradle that holds the device: the car mount remains in place. Conversely, if you change your car but keep your phone, you can simply replace the car mount. Having used Brodit holders for various iPhones (and cars) over the years, I echo Ben’s choice of Brodit for being the choice for the most solid, factory fitted-looking iPhone holders on the market. There are a few possible reasons for the resurgence. The first is that today’s podcasts are simply better. Most podcasts used to be pretty amateurish — two people talking about sports for an hour, say, or a businessman ad libbing MBA lessons. And some still are. But today’s top podcasts — and I’ll refer you to The Atlantic’s list of some of the best — are full-scale productions with real staff, budget, and industry expertise behind them. Podcasts or internet broadcasting have always been an underrated medium that in the majority of cases are available for free for playback on most any device – the problem is the industry needs to make it easy for non-tech minded folks to start listening/watching to podcasts by showing them how to subscribe to them and convince the folks to adopt podcast consuming into their daily lives for it to take off. Certainly the production values on video podcasts from the likes of Twit.tv are excellent and the majority of podcasts can be entertaining and informative and make a nice change from the usual TV shows that are broadcasted nowadays. With tablet and smartphones market share increasing every day, it’s only a matter of time before momentum gathers pace for Internet broadcasting. Cultured Code have just updated the iPad version of their award winning app Things to version 2.5 which brings full background sync, Handoff support and extension support. This update ensures that the Mac, iPhone and now iPad versions of their app all have the same new features and functionality including a fresher UI. They have also announced that version 2.6 will bring Today Widget functionality which they are working on at the moment and will arrive soon. Despite a sense of disappointment that has been levelled at Cultured Code in the past for their apparent delays to their software, with this latest release they well and truly are up to date with their app, taking advantage of Yosemite and iOS extensions and peoples misgivings should now be a thing of the past. You can find Things in the App Store here. Hot on the heels of the iPhone controlled iKettle being released, Belkin have announced The Mr. Coffee Smart Coffee Maker which is an iPhone controlled and programmable coffee maker. 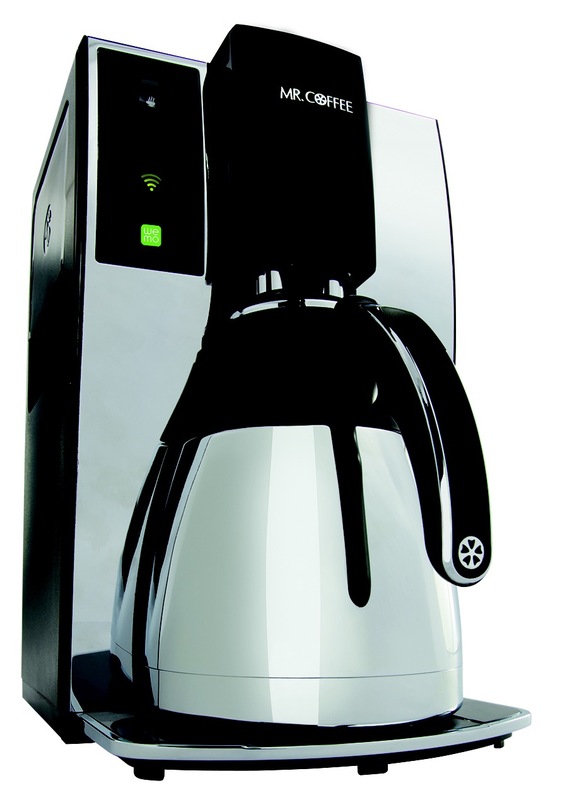 The Mr. Coffee Smart Coffeemaker enabled with WeMo is a smartphone-controllable coffeemaker which gives users remote access to all of the coffeemaker’s functions. Perfect for busy weekday mornings and lazy Saturdays alike, the WeMo-enabled coffeemaker ensures coffee is always freshly brewed. Set a schedule to have coffee ready every weekday morning at 7:30 for the morning commute or hit brew from the dinner table so coffee’s ready just in time for dessert during a dinner party. With the WeMo app, users can start or monitor the coffeemaker from anywhere. Through the app, users can also schedule a week’s worth of brew times, check to make sure the coffeemaker has a full tank of water or the carafe is in place, setup reminders, and receive alerts when the water filter needs changing, or the coffeemaker needs to be cleaned. The Mr. Coffee Smart Coffeemaker enabled with WeMo also works seamlessly with the entire WeMo family of products and partner products. In addition to WeMo’s connected capabilities, the Mr. Coffee Smart Coffeemaker is also a state-of-the-art, artisan-style coffee maker with optimal brewing technology for more flavorful, rich coffee. By heating up to an ideal brewing temperature of 205 degrees and a 10-cup, stainless steel thermal carafe, coffee stays hot until the last sip. Additionally, total brewing time for a full pot is just eight minutes, which is 20 percent faster than the average initial brew speed of the competitive coffeemakers tested. The Mr. Coffee Smart Coffeemaker enabled with WeMo is available now at Belkin.com, Mr. Coffee.com and Amazon.com with for an MSRP of $149.99. The WeMo app is available at no cost for download now at the App Store. With a SmartThings hub plugged into your home router, you’ll be able to monitor the status of your Samsung smart appliances right on your phone via the SmartThings app. If you’ve got a Samsung smart refrigerator in your kitchen, you’ll be able to check the temperature or humidity level, or receive an alert if the door gets left open. Additionally, you’ll be able to broadcast important smart home alerts to the screen that’s built into the refrigerator door. For instance, if a SmartThings moisture sensor detects a leak in the basement, the fridge will give you a heads up. The washing machine and air conditioner integrations are more focused on saving energy – and money. With Samsung’s air conditioner in your window, you’ll be able to track your energy usage and control the temperature remotely or automatically – similar to what you’ll find with the Quirky Aros. You’ll enjoy remote control and alerts for the washing machine, too, along with the ability to set it to run overnight, when energy rates are the least expensive. As for Samsung’s robot vacuum, SmartThings is promising a smart scheduling feature, along with push alerts whenever a cycle is complete, or when the dust bin needs emptying. Samsung’s also promising to leverage the vacuum’s integrated camera and microphone for smart security purposes. If SmartThings detects unexpected motion somewhere in your home, it can send the vacuum to investigate. So with Samsung starting to integrate SmartThings technology with their own products now, Samsung are all in with the notion of connecting your home appliances together to make them smarter and to make them work for you – with their recent capture of SmartThings, they certainly have a good software team behind them to make this happen. A worthwhile update to the Netflix app for iPhone 6 Plus owners other than usual Bug Fixes. Pairing this update with the iPhone 6 Plus which can show 1080p makes movies and TV shows look fantastic on the larger screen. “Masque Attack” is the new name—given by security firm FireEye—to an old trick intended to fool you into installing malicious apps on your iPhone or iPad. Most recently detailed by security researcher Jonathan Zdziarski, tricks like Masque Attack won’t affect most people, but it’s worth understanding how it works and, in the event you are targeted, how to avoid it. To avoid Masque and similar attacks, all that’s required is to avoid downloading any apps from outside Apple’s official App Store, and denying permission for any untrusted app to install. If you are concerned about being susceptible to attacks, then don’t jail break your device and only download apps direct from the App Store. Most consumer users probably won’t know how to install 3rd party apps anyway but it was worth noting for when people see a negative headline and are concerned.